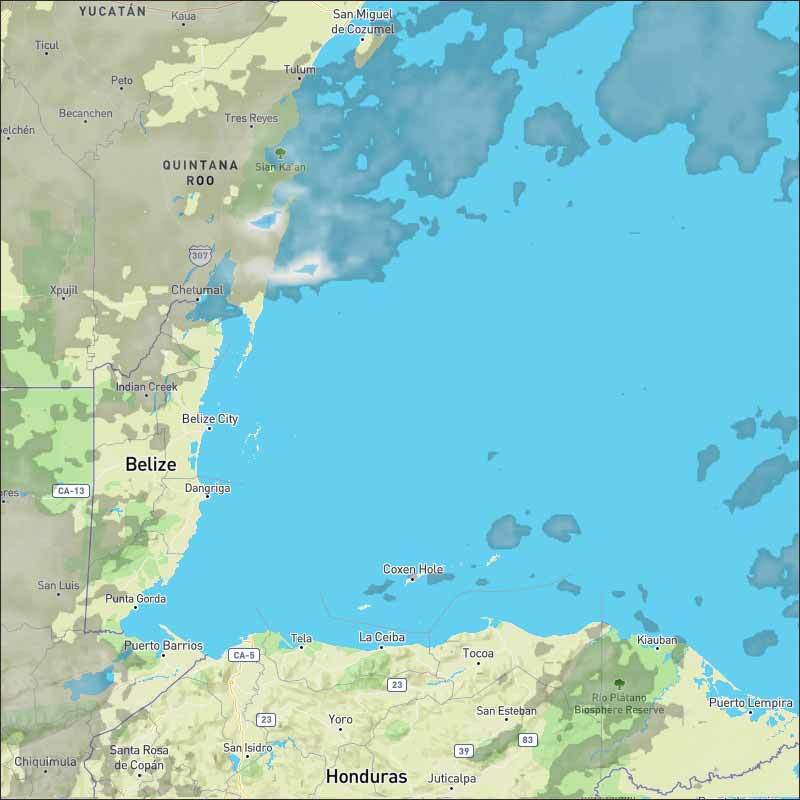 Belize NMS: A moist northeasterly airflow supports showery weather over the country. 24-hour forecast: Cloudy at times with a few showers mostly over inland areas today and then mainly along coastal areas tonight. 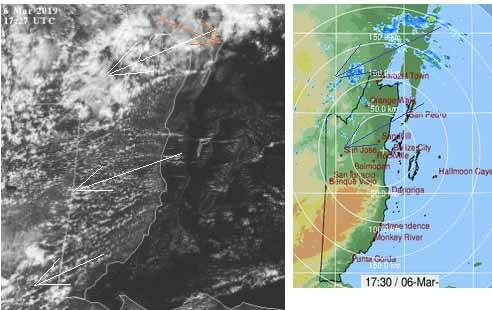 General Outlook: Is for skies to be mostly cloudy along with a few showers mainly over central and southern areas on Thursday and then mainly over southern and coastal areas on Thursday night. Today NE 5-15 kts Light Chop 1-3 ft A FEW SHOWERS OVER THE CAYES, DECREASING THIS AFTERNOON. Tonight E-NE 10-20 kts Choppy-Moderate 3-5 ft A FEW SHOWERS. Tomorrow E-NE 10-20 kts Moderate 4-6 ft A FEW SHOWERS AND POSSIBLE ISOLATED THUNDERSTORMS. Outlook E-NE 10-20 kts Choppy-Moderate 3-5 ft A FEW SHOWERS MOSTLY OVER THE SOUTH. Satellite imagery shows scattered low-topped showers moving westward over the eastern Caribbean N of 15N between 60W-80W. A cold front will enter the NW Caribbean today and then gradually dissipate over the area by Thursday. Building high pressure behind the front near Bermuda will accentuate the pressure gradient over the Caribbean, enhancing the tradewinds Thu night through at least Sun night. On those evenings, NE gales are possible off of the coast of Colombia. There is also a Gale Warning currently in effect for the south-central Caribbean waters. 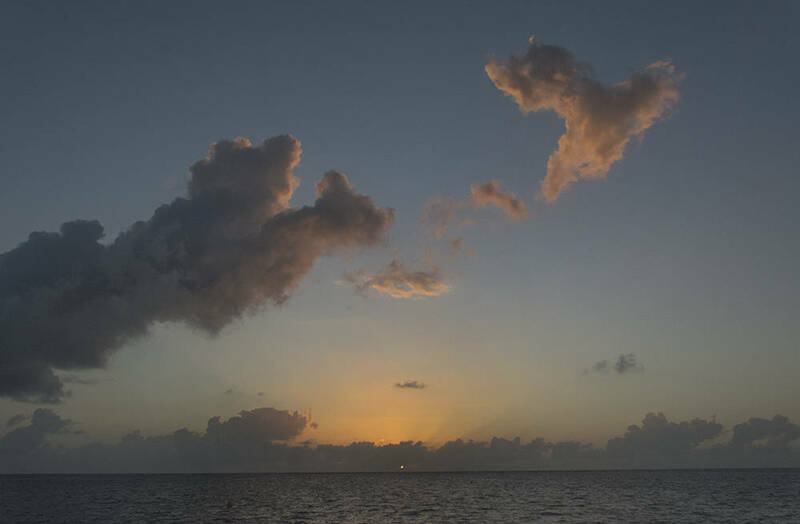 On Ambergris Caye we have another clear and calm day with the expected high temperature of 85 f.
Cloud predominates the area, over most of Belize, Mexico, the Yucatan. 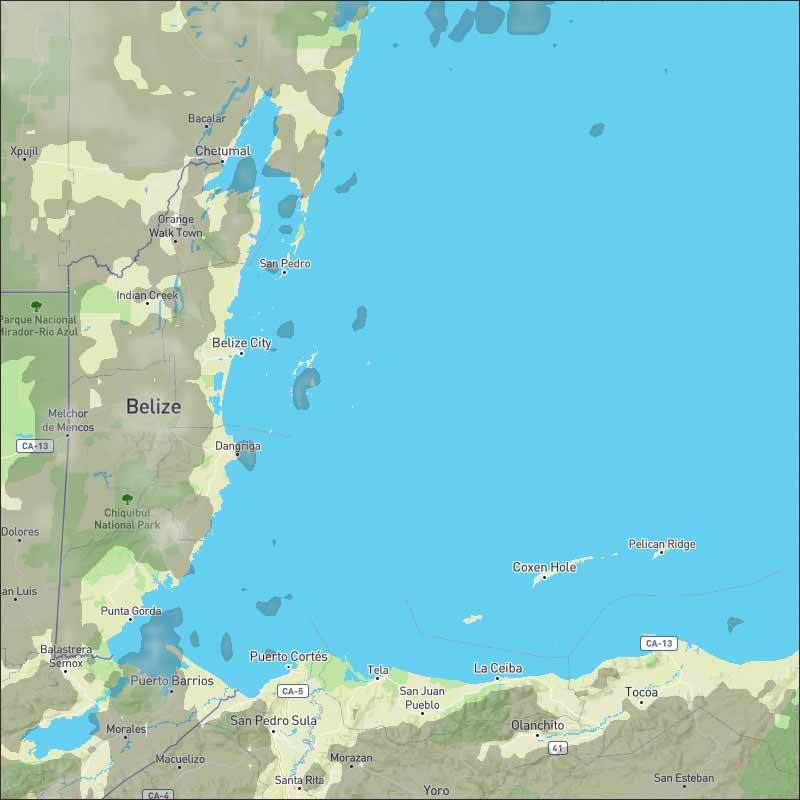 This is caused by three winds, the Caribbean from the ENE, some cool air from the NW and some high level from the WNW The has been some light rain in many parts of Belize and still some in various areas. Looks like today will be a mixture of cloud and some sunshine later, could be some rain showers anywhere. A lot of cloud activity, which has brought significant rains to the north and a little bit early this morning to central Belize. But the cloud activity resulting in rain is still up north. Looks like cloud activity will continue through tomorrow. Looks as if there will continue to be scattered rain mainly near or around the north over night, then more cloud tomorrow, with a chance of scattered rain, again mainly in the north, but could be some in other places over night.